rapid extinction of the weaker elderly individuals saves resources for survival of the younger and stronger ones. in silico experiments confirmed the lack of fatal contradictions in our logical construction. When the aging program is enabled at age of 25-30 years, it results in increasing population survival by 24-26%. Key words: aging, phenoptosis, multi-agent simulation, extinction, resource shortage. The assumption that in animals aging represented as a slow phenoptosis is a process characterized by decreased viability controlled by a special genetic program turned out to be highly fruitful, primarily, for practical gerontology . A search for the aging program “switch-off” resulted in emerging of a number of promising drugs. Among them, the most effective drug can be used for treatment of a broad range of age-related pathologies, including senile vision impairments. However, by admitting a programmed organism aging hypothesis, it inevitably raises a question as to what advantages does it give to communities containing elderly and naturally weakened individuals. It is clear that if no such advantages existed, then any quite complex program would have been eliminated by random mutations acting in this situation as adaptive mutations. A number of authors consider aging as an evolution accelerator [1, 2]. It is assumed that progressive evolution particularly undergoes acceleration resulting in large-scale system alterations known in Russian-language publications as aromorphosis. The vast majority of publications on mathematical simulations for aging populations are also dedicated to analysis of evolutionary processes. A fundamental study published by Partridge and Barton  demonstrated that occurrence of elderly individuals in a population optimizes r-value that characterizes rate of population growth and is accompanied by optimization of variability characteristics. Later, the approach developed by Partridge and Barton was applied for solving specific tasks [4, 5]. However, in our opinion, the certainly reasonable assumption that aging may accelerate evolution needs to be updated. Both the majority of modern and extinct species described by paleontologists are characterized by a stasis that lasted for millions of years, i.e. lack of significant changes [6, 7]. There are some species that have been preserving general characteristics of the body structure, principles for regulation of gene activity, and metabolic pathways for hundreds of millions of years ‒ yet they continue to senesce. Among them, there are some nematodes, arthropods, and marsupials (American opossum). A natural question arises – if aging program acts only as evolution accelerator, then why is it not eliminated during a stasis period? Moreover, current evolutionary theory is far from being considered as a finished logical construction. Synthetic theory of evolution (STE) as the most elaborated version of evolutionary theory is unable to explain the reasons for preserving in live species not only aging, but gender, genetic variability, etc. .
A multi-agent approach was applied to simulation modeling for studying population behavior. A multi-agent simulation can be applied to study decentralized systems elucidating global functional patterns within a model by analyzing behavior for a group of agents exhibiting particular laws for their behavior and interaction with model environment and between each other. 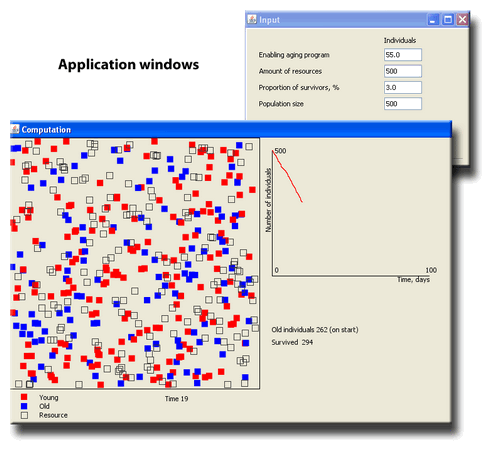 We developed a multi-agent simulation model of population that was used for performing quantitative analysis. The model was created using Java technology (Java 7 version) and NetBeans 8 IDE. When a model is run, agents (individuals) are generated independently of each other, which are considered as objects having randomly distributed reservoir of resources and being posed at random points within a square area of dissemination; all modifications of agents occur within the area that can be called as a range of model. Age of agents comply with the distribution pattern published by G. Libertini . Such distribution was described for the Ache aboriginal tribe of Paraguay because age characteristics of the Ache population are not much affected by civilizational influences (wars, migration, etc.). Speed and direction of movement are randomly set. Agents do not interact between each other. In a range of model, the reservoir of resources is posed at random points to be consumed by agents that results in increasing their own energy content. Depending on conditions of a numerical experiment, there can be renewable and non-renewable resources. When the level of an agent’s energy content is equal to zero, the agent starts to starve. After a predetermined amount of time, the agent dies if it was unable to replenish its own energy content. In a model, death of an agent from starvation is the only source altering size of population. The size of a population, onset of agent’s old age, and amount of energy content and its renewability as well as onset of starvation death are set experimentally. An agent that reached 80% of its own old age had speed of movements that decreased to 25% of its initial value. An agent that reached the onset of its own old age had speed of movements that decreased to 10% of initial value. Under otherwise equal conditions, younger individuals would have advantage in consuming resources. Individuals that reached 80% of their own old age would consume resources on a common basis. In our model, aging had a threshold nature, i.e. while passing an aging threshold individuals lose their “vital power” suddenly and do not undergo further aging. We considered such assumption acceptable because results of modeling are not crucially altered when stage of aging increases to five. During in silico experiment, an Extinction Time (ET) necessary to reduce population size by a defined percentage (%) out of initial size (designated as subscript index) is determined. Thus, ET95 is an amount of time necessary for a population to lose 95% of its size, etc. By setting the onset of old age, it is possible to alter a number of elderly individuals in a population. A population fully consisting of young individuals is formed if the onset of old age is set at 77 years due to an age-dependent distribution of agents in the model. A population fully consisting of elderly individuals is formed if the onset of old age is set at ≤10 years, as the lower limit of the agent’s age is artificially restricted by 10 years during formation of the population. This is due to the pattern of age-related distribution that corresponds to the point of transition from high child mortality to mortality rates typical to a greater part of the life cycle. It can be said that according to the model conditions in case of scare resources, such cohort of agents obtains no feeding, which accounts for their extinction, thus making no contribution to design parameters. Technically, while generating a set of agents, individuals under 10 years of age are excluded from consideration. To ease experimenting, an applet was developed that allows running a preset number of independent models with similar initial conditions, excluding the onset of old age, followed by performing statistical analysis. The applet has an intuitive and user-friendly interface (Fig. 1) and does not require special computer skills. Fig. 1. Modeling program interface. The full version of the model is available for download at here.To run the model, JRE version 7 or older must be installed on your computer. The results of the modeling are presented in Figs. 2 and 3. The following parameters were applied: onset of old age ranged from 10 (all elderly individuals) up to 80 (all young individuals) years of age, with 5-year increment, initial size of population was 500 individuals, and initial reservoir of resources was 500 units. ET97, ET95 и ET90were calculated. Each numerical experiment was performed in 100 replicates. In case of limited but renewable resources (Fig. 2), individuals die quite rarely when a minimum level of reservoir of resources and a maximum distance from its source coincide. Under such circumstances, ET monotonically increases upon increasing onset of old age from 10 up to 80 years of age (by decreasing percentage of elderly individuals in population) and reaches 104-2318 days, respectively. In case renewal of resources is disabled (Fig. 3), it results in a different pattern. It is clear that in this case, ET is much shorter and its magnitude is related to percentage of the elderly individuals in population. This is especially evident for 97, where its magnitude peaks upon turning on the aging program at age of 30 years, where percentage of the elderly individuals in the population is 79%. By further elevating a threshold for onset of old age, it results in a virtually linear decline of 97 value. Similar behavior, although less pronounced, is observed for ET90. Whereas for 97 a 24-26% increase can be achieved under given conditions, for ET90 it does not exceed 7-8%. Opportunities of mathematical modeling of live systems are limited largely by their complexity. It forces model developers to focus only on some of the processes, which are selected rather subjectively as being the most relevant ones with respect to the posed task. Our model allows simulating a rather narrow range of processes related to evaluation of the impact by the elderly, predictably weakened, individuals on survival of a population under conditions of temporary shortage of resources. Undoubtedly, in nature there exists a whole number of other mechanisms facilitating survival of animal communities during drought, crop failure, etc. It is quite likely that one of such mechanisms is related to retarded aging upon limited feeding. On the other hand, it may be assumed that occurrence of elderly individuals may increase “survival of communities” in other situations, e.g. related to disease outbreaks. Undoubtedly, mathematical modeling does not replace examination of nature. However, Nesse and Williams emphasized that : “intuitive ideas about fitness, even the intuitions of professional biologists, may not always be adequate. Serious, often mathematical, theorizing is needed to provide the logical answers that can then be tested by investigating real organisms”. In our case, despite all the simplifications made, in silico experiments conducted within the proposed model confirmed the lack of fatal contradictions in logical constructions. A quite simple model is sufficient to observe that occurrence of weak individuals that extinct first under conditions of resource deficiency can remarkably increase chances for survival of a population by prolonging lifespan of a small group of the last survivors. We suppose that in the current study there is no need to thoroughly analyze spread of situations when animal populations are markedly reduced in size due to the shortage of water and/or food. It is intuitive that hard times occurred in the natural history of numerous species including humans. Earlier, we applied a multi-agent modeling to simulate mechanisms of aging [10-12]. Results of the current study demonstrate that it can be used for tasks of population biology of aging as well. In principle, the goals posed in the study might be solved analytically; however, if necessary, a multi-agent simulation model allows increase in complexity of the set goals without conceptual alterations to the model. For instance, a time-dependent alteration of agents’ behavior will virtually not complicate a multi-agent model, whereas non-stationary analytical models are usually hardly amenable to solution. Another advantage of such approach is that no a priori knowledge about patterns of system behavior is expected. By determining behavior of an individual agent (an individual), a researcher may find out some global pattern of system behavior (population) as a whole formed as a result of agents interacting with environment and each other. Obviously, more than one type of agent can be created. In the future, we plan to extend an application of such approach for modeling an impact by aging on fitness of animal populations to a broader range of environmental changes. This study was conducted with the financial support from the Research Institute of Mitochondrial Engineering, Moscow State University, and Ministry of Education and Science of the Russian Federation (project No. 1878). The paper was prepared as a part of project “Support for Conducting Scientific Research”. 1. Skulachev, V. P. (2012) What is “phenoptosis” and how to fight it? Biochemistry (Moscow), 77, 689-706. 2. Mitteldorf, J. J. (2012) Adaptive aging in the context of evolutionary theory, Biochemistry (Moscow), 77, 716-725. 3. Partridge, L., and Barton, N. H. (1993) Optimality, mutation and the evolution of ageing, Nature, 362, 305-311. 4. Novosel’tsev, V. N., and Novosel’tseva, Zh. A. (2012) Modeling of history of life and balance of resources, in Gerontology in silico: Emergence of a New Discipline. Mathematical Models, Data Analysis and Computational Experiments (Marchuk, G. I., Anisimov, V. N., Romanyukha, A. A., and Yashin, A. I., eds.) [in Russian], BINOM, Laboratoriya Znanii, Moscow, pp. 148-175. 5. Novosel’tsev, V. N., Novosel’tseva, Zh. A., and Yashin, A. I. (2012) Population models of aging, in Gerontology in silico: Emergence of a New Discipline. Mathematical Models, Data Analysis and Computational Experiments (Marchuk, G. I., Anisimov, V. N., Romanyukha, A. A., and Yashin, A. I., eds.) [in Russian], BINOM, Laboratoriya Znanii, Moscow, pp. 175-194. 6. Simpson, G. G. (1983) Tempo and Mode in Evolution, Columbia University Press, N. Y. 7. Kunin, E. V. (2014) The Logic of a Case. Regarding Nature and Origin of Biological Evolution [in Russian], Tsentr-Poligraf, Moscow. 8. Libertini, G. (2013) Evidences in favor of aging theory based on the study of a hunter–gatherer people (Ache of Paraguay), Biochemistry (Moscow), 78, 1023-1032. 9. Nesse, R. M., and Williams, G. C. (1995) Evolution by Natural Selection. Evolution and Healing (Nesse, R. M., and Williams, G. C., eds.) Weidenfeld and Nicolson, London, pp. 13-25. 10. Chistyakov, V. A., and Denisenko, Yu. 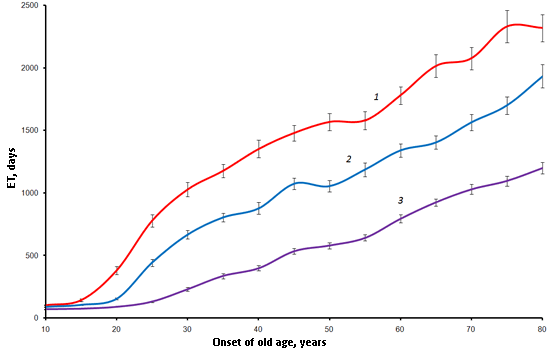 V. (2009) Age-related loss of cellularity: in silico examination, Ros. Khim. Zh., 53, 105-110. 11. Chistyakov, V. A., and Denisenko, Yu. 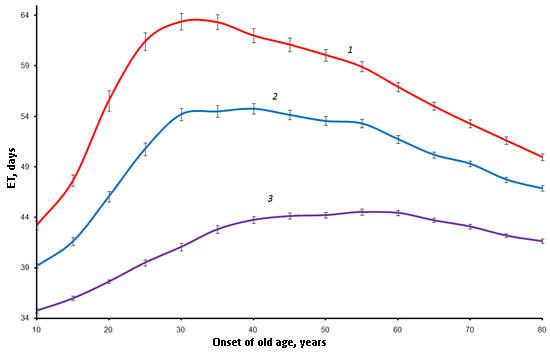 V. (2010) Simulation modeling of aging in Drosophila in silico, Uspekhi Gerontol., 23, 557-563. 12. Chistyakov, V. A., and Denisenko, Y. V. (2012) Cellularity loss and Dilman’s problem: an in silico study, Biochemistry (Moscow), 77, 779-792.